These two ideas wrap up our week of trains, trains and more trains. Idea One is to make a Sorting Train. I’ve seen lots of lovely train sets available in shops but my daughter specifically wanted one which had open carriages so she could take her toys for a ride, so we made our own. We used plastic box containers from the recycling bin for the carriages and attached them together with string – very simple, but just what she wanted. She loaded the train with her toy passengers and played with the train in this way for a while. We have open shelving in the playroom to encourage the children to be creative and grab their own props when they’re playing, and today the wooden blocks were chosen. I asked my daughter if she could sort the blocks into the carriages by colour – which you can see she did. This classification ability – being able to sort objects into groups, be it by colour, size, purpose – is actually a pre-reading skill. It encourages logical thinking and helps to develop visual discrimination skills. Being able to look at a selection of objects and sort them is a step on the way to looking at a selection of letters and words and being able to read them. Of course, she was just having fun! 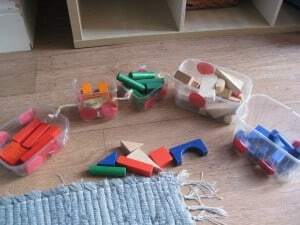 Once the train was loaded she delivered the different coloured blocks to stations around the room. We used the wooden blocks again for Idea Two. 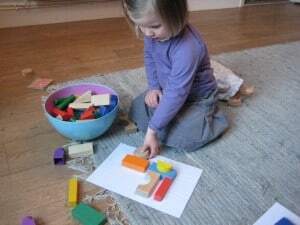 My daughter enjoyed using felt shapes to make a train picture yesterday, so I thought I’d make her a ‘matching puzzle‘ using our wooden blocks. 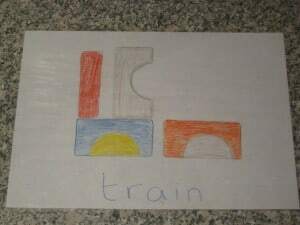 On a piece of paper I lay out some blocks to make a train shape and drew round them. Then I coloured them in colours that matched our blocks. Then I asked my daughter if she could use the tub of blocks to find the right ones to go on top of the paper picture to make a block train. – their shape – rectangle or square? – their size – big rectangle or small rectangle? – their colour – red semi circle or yellow semi circle? – their orientation – arch pointing left or right? You could adapt this puzzle game to the shape of blocks you have and what your child likes. You might make a house picture, a face or even a random pattern. If your child enjoys jigsaws, whiy not give this a try? I love the application of these fun games, and how even though she is playing and being creative, she is also using lots of problem solving skills. Great ideas!!! I love this idea! May just try it with the little ones this afternoon. Thanks for the comment Nina – hope you have fun with it!